Remedy does not offer any booking services that we know. You can always contact them to check. Remedy has a lot to offer. Leave frantic Pollokshaws Road behind and step into the peace and calm of a deli, a cafe and a shop selling special items. A creaky wooden floor and high Victorian ceiling with quaint moudings set the scene for a cosy, laid back time. The menu offers home made soups and sandwiches, with toasted mozzarella and vegetable panini going down well. The deli counter serves up a good range of cheese and salamis to take home. Do spend some time browsing the shelves to Remedy's rear. Yummy chocolate is within reach (for a gift or for your own happy mouth) , and this is the place to come when you need a jar of duck fat! Great news! Finding this page means you can now join our VIP list for Remedy. Grab your very own web page all about Remedy. Do you have a special story about Remedy? A funny experience? A grand occasion? A funky photo? A personal tip? A top secret? 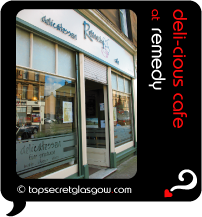 Remedy deli - making up your very own sandwich creations!